A big departure from Omnio, which left me a little disappointed at first, considering how massive that album was, but upon further listen, I've decided that Strange In Stereo is a more than worthy follow up. Ambient, emotional, direct, indirect, subliminal, psychological, this album is full of suprises. After a few listens it really sinks in, and it sinks in deep. 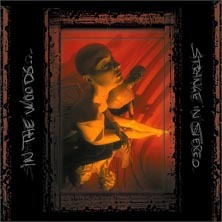 In the same way that Omnio totally changed the face of what In The Woods... stood for, Strange In Stereo again reinvents the band. This is definitely not black metal anymore, probably not even metal, but don't even think of accusing them of selling out. Sprawling structures, intentionally obscure melodies, and heart wrenching vocals make for a decidedly "anti - pop" experience. The instrumentation is once again beautifully varied. They got some great keyboard sounds, not to mention the wealth of unidentifiable noises I encountered. Female vocals are more prominent, and the clean vocals continue to improve. It's very difficult to compare this to anything, as it's exceedingly unique. Probably the closest thing to this would be their last album, Omnio, despite all the differences. I would say that if you liked that album (if you heard it, you probably did), then do yourself a favor and check this one out. You may like it, you may not, but at least give it a chance. It's definitely a worthwhile experience.